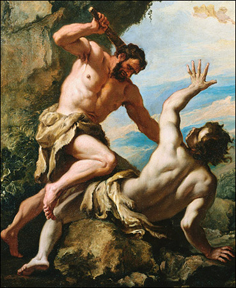 The conflict between Cain and Abel and the latter’s death at the hand of his brother Cain, is relatively straightforward. Cain and Abel are probably twins, of which Cain is the first born. After they grow to be young men, Cain kills his brother when his despondency1)Following God’s dismissal of Cain’s offering. leads to homicidal rage. There is much to unpack here. First, we’ll see that the setting is a natural follow on to the Garden of Eden and, to some scholars, is thought to have once been part of that narrative. Because I’m sympathetic to this point of view, this translation will terminate at verse 4:16 in which Cain settles in the land of Nod – a natural conclusion to the Garden of Eden story taken through the primeval couple’s immediate life after expulsion. Second, the theological depth of the story is uncommonly profound, dealing as it does with the value God places on motherhood, the issue of fratricide (one that runs through much of the Hebrew Bible (a.k.a. Old Testament)), and finally how mankind is to deal with the passions that can lead to sin, be they rage, lust, hate, envy, etc. 1. ↑ Following God’s dismissal of Cain’s offering. We are requesting non-exclusive, world rights in English, for the print and electronic edi¬tions of this book. If you are the copyright holder or administrator, may I have permission to use the material listed above in my book, to be published by Wipf and Stock? If you would like some other acknowledgment than the usual scholarly form, please indicate that. If you are not the copy¬right holder, please let me know.